Whilst on a recent trip to The British Virgin Islands I met a couple who’d had a miserable journey and they suggested that we post our experiences online. So starting December 2014 we are writing a travel blog giving tips and information about places that we ship to. Our first review is the beautiful Island of Bequia in The Grenadines. Bequia lies in the Windward Islands, just a few miles from St. Vincent and close to Canouan with its Raffles resort and Mustique the Private island of the Rich and famous. 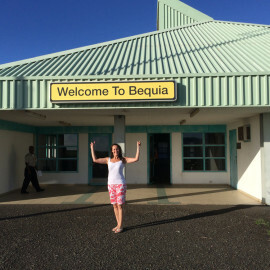 Bequia is beautiful and with quiet white sand beaches, friendly people and an easy going feel. Getting there fast : fly to Barbados and take SVG Air http://www.svgair.com/ on a shared charter for about USD 500 roundtip. Getting there cheap: take Liat www.liat.com to St. Vincent and take the ferry from St Vincent to Bequia. Where to stay: there are many small boutique hotels but my favourites are. Firefly, and Bequia Beach resort. There are good restaurants on the island and the hotels offer great food.